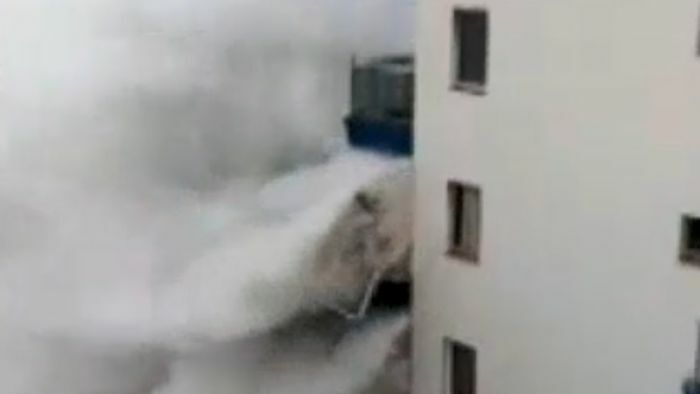 Waves as high as 6 meter pummeled apartment buildings in the Canary Islands like wild weather forced dozens to evacuate. Local media reported 65 apartments evacuated as waves crashed in land in Tenerife Mesa del Mar, ripping rails from apartment balconies. Local mayor Alvaro Davila said that no one had been injured. Thirty-five people were also evacuated from the city of Garachico on Saturday night during the stormy weather, local media said. In the meantime, wild weather continued to infect Spain, as the National Weather Agency declared Valencia and Alicante on red alert, the maximum risk level, due to heavy rain on Monday. Mallorca was placed on orange alert, denoting serious risk and the rest of the Balearic and Murcia in southern Spain received the third floor yellow warning labeled as risky.